The strain relief fitting is resistant to salt water, weak acids, weak alkalis, alcohol, esters, ketones, ether, gasoline, mineral, animal, and vegetable oil. Simply push the cable throught the installed strain relief fitting and tighten the dome or flex nut for a liquid tight connection. 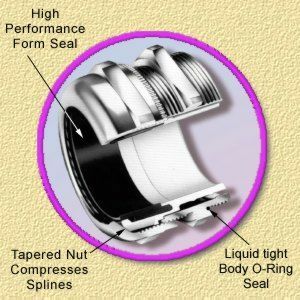 The integral O-Ring seal between body and housing eliminates the need for extra seals. No disassembly is required: Insert cable - Tighten Nut - Finished! Exceeds NEMA 4x or 6 specs. The O-Ring between body and housing assures a reliable seal. It is suitable for submersed applications. Up to 150 PSIG external pressure.  10 sizes accomodate cable diameters from 1/16" to 1-3/4". The flexible spline design results in the largest cable range per size available. The Nickel Plated brass Strain Relief Fitting gives superior protection against corrosion and enhances the appearance of you product.